Al Falah University has come into joint agreement with University of Salento, Italy to support each other in all areas of education and exchange of experiences, information and scientific research as well as conferences and specialized workshops. The signing of the agreement took place on the University campus in the presence of the Chancellor Dr. Noor Atatreh and Vice President for Academic Affairs Dr. Sameer Al Barghouthi from Al Falah University and Prof.Enrico Ciavolino from University of Salento. The agreement focuses on the scientific partnership between the two universities for the development of education in the United Arab Emirates. welcoming speech on the importance of organizing such workshops in collaboration with various The workshop addressed various important research topics, such as the study of the relationship between transparency and happiness in the Arab world, in addition to measuring the causes of premature death costs resulting from environmental pollution. 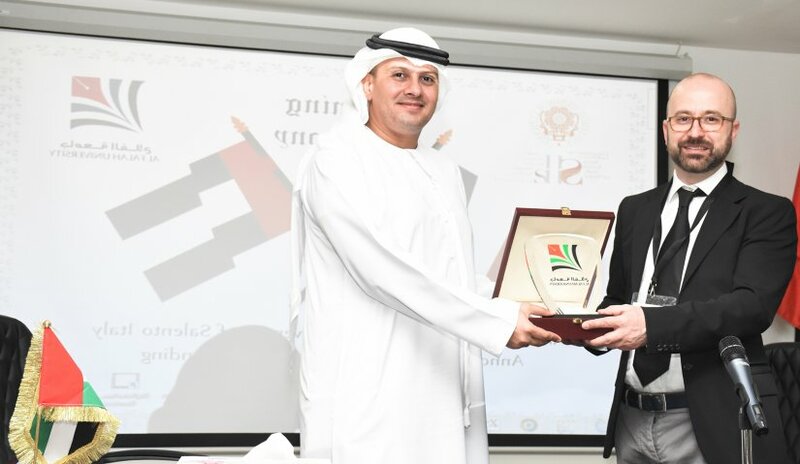 academic institutions outside the state and within it, for the sake of developing curriculum in higher education institutions of the United Arab Emirates. Al Falah University looks forward in the future to organize a number of scientific conferences and workshops that will strengthen the output of higher education in the United Arab Emirates.